Scrap the little stuff.. it's what really counts. Come join the Adventure with Canadian Scrapbooker Design Team Member Lara Brooks Product reviews, page challenges, blog candy, card and layout ideas, and anything scrapbook related. At least I have been crafting, and Christmas has definitely arrived at our house. One of the Tree's is up, the garland is on the staircase, and we've got christmas lights in the front windows. Still more to be done, but that will have to wait until this weekend. In preparation for the holiday season, I've been working on some of my homemade gifts. 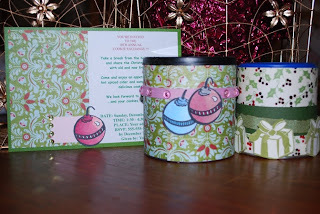 I started with these adorable little decorated gift tin... aren't they cute? So easy to make, and they are really in expensive too as they use a recycled container, small pieces of paper, and just a few embellishments and stamped images. I used my Merry Mr. Snowman set from myStampBox which is getting a lot of use this season! Perfect for holding home made cookies and giving as gifts for colleagues or teacher, or use them at a Cookie Exchange. 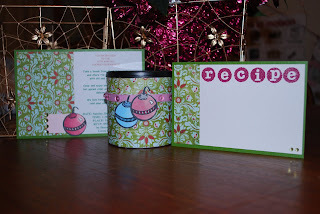 I'm also thinking that I'll be doing some of these with larger tins, and non holiday paper with the kids, to give as teacher gifts as shown over on Splitcoast Stampers today. 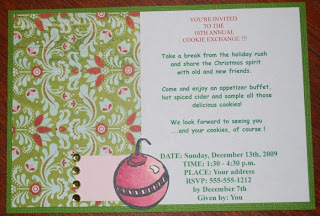 You can see that I made some extra coordinating pieces, including a recipe card and an invitation.... so much fun once you get going! I think I've finally decided on a cookie for my upcoming cookie exchange... Lemon Raspberry Thumbprints. They sound delicious and I love anything lemon! Preheat the oven to 350 degrees F. Lightly butter 2 large baking sheets. In a small bowl, combine the jam and Chambord. Stir to combine. In a medium bowl, combine the flour, baking powder, and salt and whisk to blend. In a large bowl using an electric mixer, beat the butter and sugar until light and creamy. Beat in the egg yolks, lemon zest, lemon juice and vanilla. Add the flour mixture in 2 additions and beat just until moist clumps form. Gather the dough together into a ball. Pinch off the dough to form 1-inch balls. 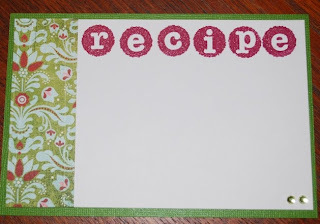 Place on the prepared baking sheets, spacing 1-inch apart. Use your floured index finger or 1/2 teaspoon measuring spoon to create depressions in the center of each ball. Fill each indentation with nearly 1/2 teaspoon of the jam mixture. Bake until golden brown, about 20 minutes. Transfer the cookies to wire racks to cool completely. I've got to get going on my Christmas Cards next.... stay tuned! Wow, awesome cookie set! Have you tried the Lemon Raspberry Cookies? Are they good? Yes I can't believe you haven't blogged for a month either. Have a great 2010 créative! Price includes all supplies to complete each layout and all design time. Also included is 1 interview to gather facts, get organized and pick a theme. A follow up meeting is also included to review work that has been completed to date (normally 6-8 layouts) to ensure everything is progressing as desired.